Though originating from Germany, the tradition of Christmas markets has spread all over Europe and even reached its easternmost borders. 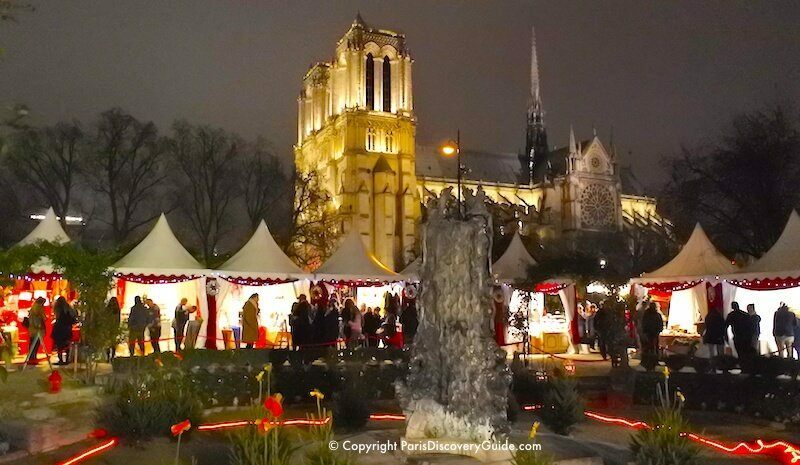 Nowadays, you can’t imagine the holiday season in Paris without its famous sparkling Christmas markets. The holiday lights are usually turned on in the middle of November and, Christmas markets can be found all over the city. You can count, at least, 30 of them. Some are only open for a day or a weekend, while others are available throughout the holiday season, up until mid-January. Here are some of the most popular and festive ones. 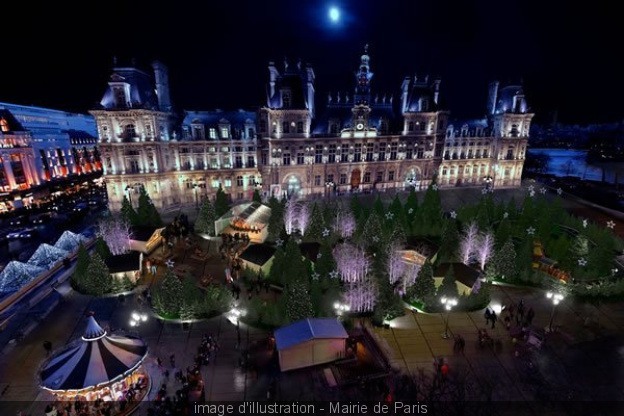 The most famous market in Paris within many years, the Champs-Élysées Christmas Market will not take place at the Champs-Élysées avenue anymore. It has been moved to Tuileries Garden, due to the dispute between its owner and the City of Paris. Nevertheless, the world’s best known shopping boulevard is just five minutes away by foot. 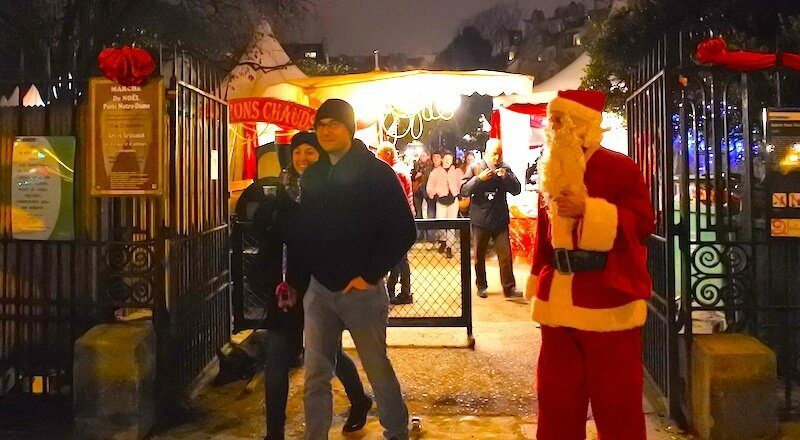 The market has also got a new name: La Magie de Noël (The Magic of Christmas). It will consist of 100 chalets, with a wide variety of French products presented. Cheese, wine, hand-made souvenirs of all kinds, as well as numerous carnival rides, and an ice rink… All these treats you will find in Jardin de Tuileries. Located in the Viviani Square, right next to the magnificent Notre Dame Cathedral, this market is, probably, the most picturesque of all the Parisian markets. Its uniqueness is shown in the wide variety of artworks presented here. You can find a great collection of unique clothes and accessories, created by French artisans. Jewelry, ceramics, decorative ironwork, leather items, tableware… You can shop or just admire this festival of arts, while drinking mulled wine on a nice frosty winter evening. 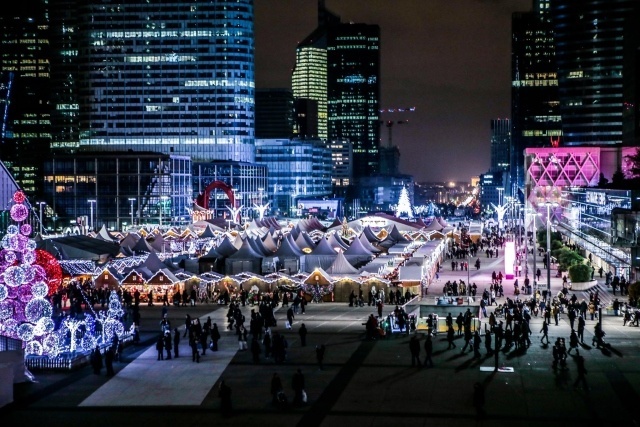 Spread along the Esplanade at La Défense, 300 Christmas chalets form the largest holiday market in the capital of France. A vast collection of gifts, including jewelry, leather items and trinkets, as well as well-equipped restaurant stands, will make sure you have a great time at La Défense. Just a 9-minute ride away from the Étoile metro station, you will find yourself in a fairy tale village of Christmas lights and decorations. For about three weeks, from mid-December until the beginning of January, the square in front of the City Hall turns into the majestic holiday market. Fir trees and white birch trees, decorated with lights, create a fantastic atmosphere of a fairy tale forest. Kids will enjoy amusing rides. While adults will find themselves caught in the variety of artisan products and Christmas delicacies, such as mulled wine, waffles, and pancakes. 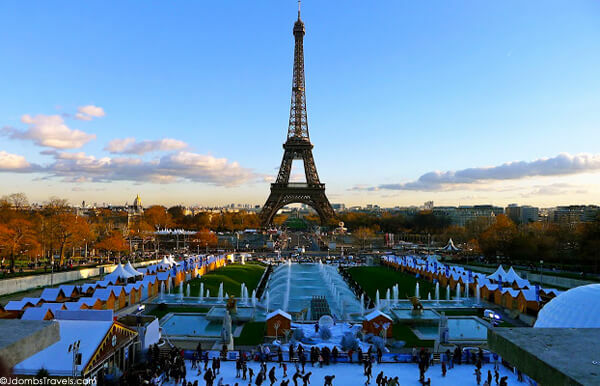 Right next to the Iron Lady, the symbol of Paris, a skating rink appears every holiday season. Fun for both children and adults, it is surrounded by 100 stands with gifts, decorations, and holiday goods of all kinds. Of course, treats are included too, such as tartiflettes, toasted marshmallows , roast chestnuts [marrons chauds]. Les Halles is a large covered market in the capital of France mostly underground, with a direct connection to the Chalet metro & RER. 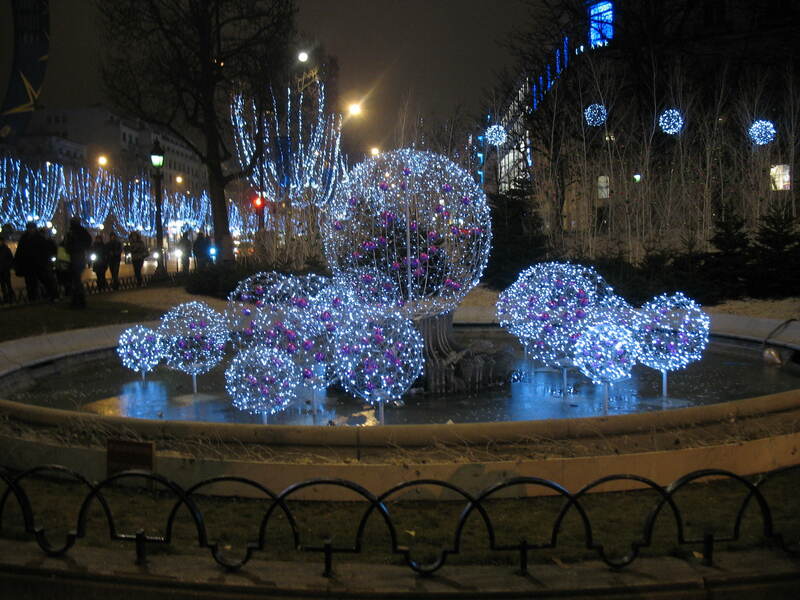 Situated in the 1st arrondissement, it offers an enchanting variety of Christmas activities and goods. 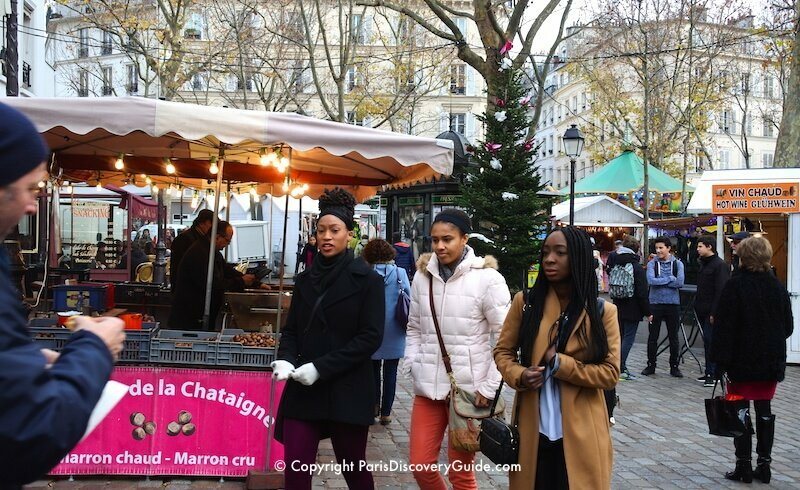 The stalls offer mulled wine, freshly cooked crepes with a variety toppings, and roasted chestnuts. Your mouth is about to water with the variety of french delicacies available such as foie gras, sausages, salted nuts, cheese of all kinds, available. French artisans offer hand-crafted goods for every taste and budget. While the displays of Christmas lights make the market particularly festive during the night-time. Located in Montmartre, the Place des Abbesses market is not large, but still, pretty charming. Truly unique hand-made items, such as hand-knitted scarves and kids’ toys can be found here, along with typical Parisian holiday treats: vin chaud (mulled wine) and marrons chaud (roasted chestnuts). Children can enjoy a colorful carousel and adults will be fascinated with the view of the city from the nearby Sacré-Coeur Cathedral. 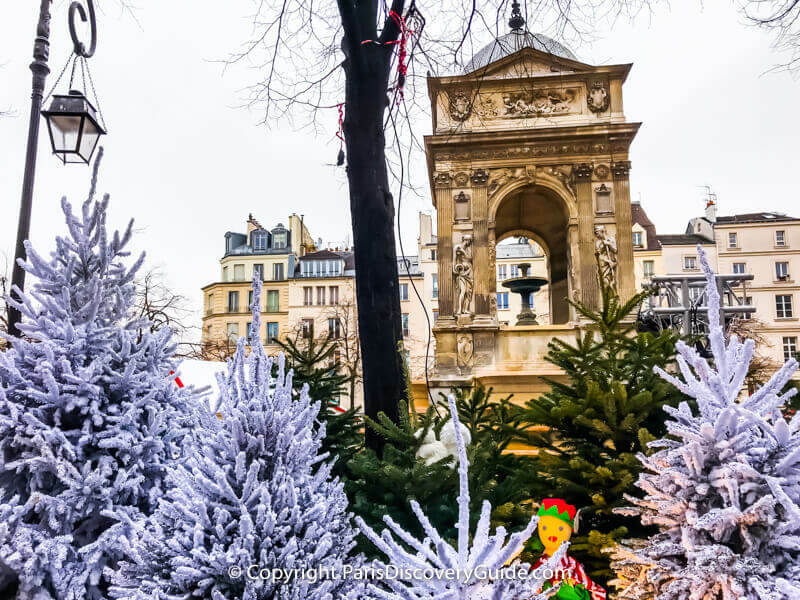 If you want to feel the real Christmas-in-Paris atmosphere, yet avoid huge tourist crowds, Place des Abbesses Christmas Market is your place to go. 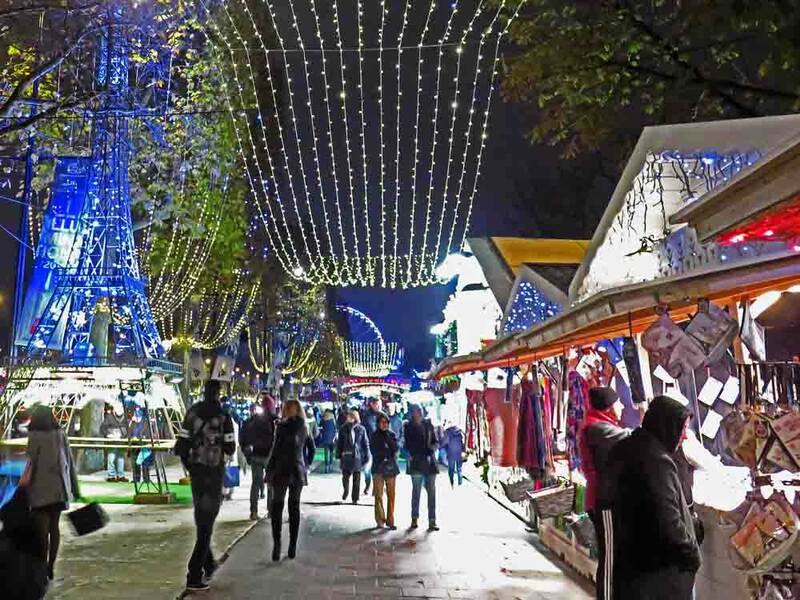 Held at Gare de l’Est every year, the Alsace Christmas market is where you find famous wines of Alsace, sausages, foie gras, gingerbread, pretzels, sauerkraut, Christmas biscuits, cakes, and other delightful foods from the easternmost region of France. Real Parisians never miss this market, and neither should you. 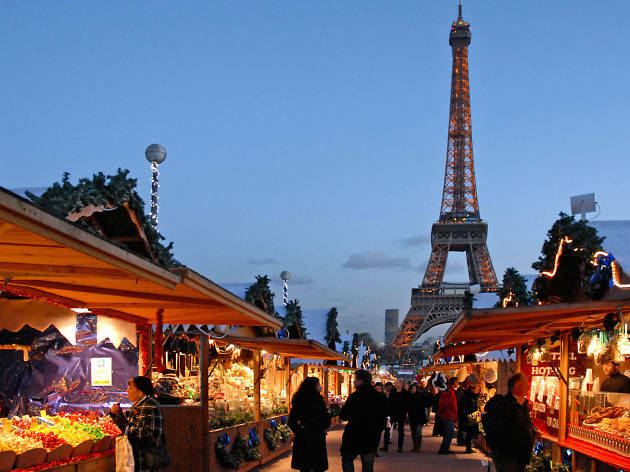 These are just a few of the many markets that you may find as you wander around Paris during December and early January. If the weather is cold then that mulled wine is a god-send. Dress warm and if you are lucky [?] you may also see some beautiful frozen fountains.